Finely slice the chicken thighs into long slices. Mix all of ‘The Marinade’ ingredients together in a bowl and then add the sliced chicken, massaging the marinade mix well into the meat. Next, thread the chicken onto your soaked bamboo skewers, ensuring there is a thin layer of meat on each, and leave to the side. In a saucepan, fry the paste with 1-2 tbsp vegetable oil for 5 minutes, until fragrant and starting to brown. In a new bowl, mix all of 'The Sauce' ingredients together well. Pour this sauce mixture into the saucepan with the paste and bring to a gentle simmer. Reduce the contents off the saucepan by half and you're Quick Satay Sauce is done! Pour it into a serving bowl and set aside. Get a frying pan to a high heat. Add a dash of vegetable oil, then place your chicken skewers into the pan and cook on one side for 3-4 minutes. Turn and do the same to the other side, ensuring that the chicken is golden brown in colour and has a lovely char on both sides. 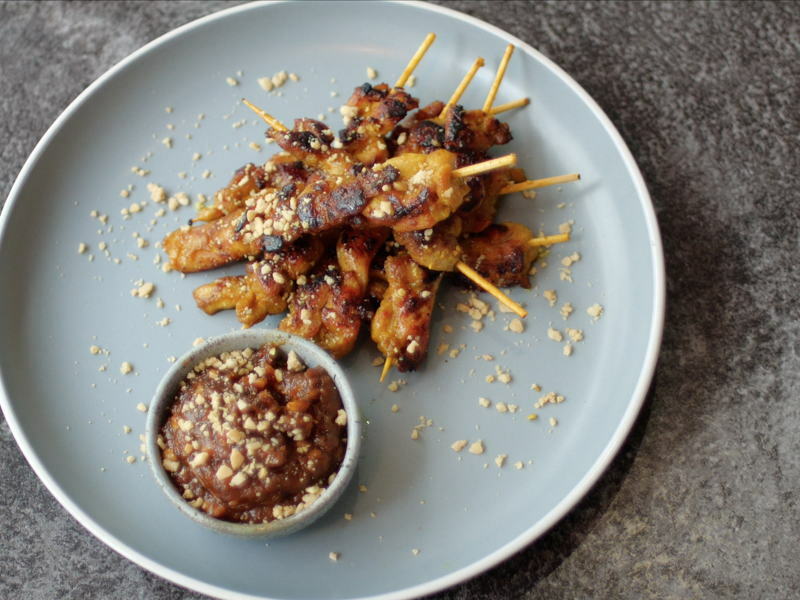 Serve on a plate, accompanied by your bowl of Jeremy’s Quick Satay Sauce. Get dipping!